Another separateâ€”but no less importantâ€”part of creating web pages is Cascading Style Sheets (CSS). As you probably know, CSS is a style language that describes how HTML markup is presented to the user. CSS3 is the latest version of the CSS specification. CSS3 contains just about everything thatâ€™s included in CSS2.1, the previous version of the spec. It also adds new features to help developers solve a number of presentation-related problems without resorting to scripting plugins or extra images. New features in CSS3 include support for additional selectors, drop shadows, rounded corners, updated layout features, animation, transparency, and much more. CSS3 is distinct from HTML5. In this publication, weâ€™ll be using the term CSS3 to refer to the current level of the CSS specification, with a particular focus on whatâ€™s been added since CSS2.1. Thus, CSS3 is separate from HTML5 and its related APIs. One final point should be made here regarding CSS and the current â€œversion 3â€� label. Although this does seem to imply that there will one day be a â€œCSS4,â€� Tab Atkins, a member of the CSS Working Group, has noted that there are no plans for it. Instead, as he explains, the specification has been divided into separate modules, each with its own version number. So you might see something like â€œCSS Color Module Level 4â€�â€”but that does not refer to â€œCSS4.â€� No matter what level an individual module is at, it will still technically be under the umbrella of â€œCSS3,â€� or better yet, simply â€œCSS.â€� For the purposes of this book, weâ€™ll still refer to it as â€œCSS3,â€� but just understand that this is likely to be the last version number for the language as a whole. Why should I care about CSS3? 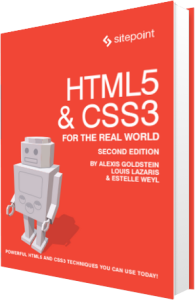 Later in this book, weâ€™ll look in greater detail at many of the new features in CSS. In the meantime, weâ€™ll give you a taste of why CSS3â€™s new techniques are so exciting to web designers. Some design techniques find their way into almost every project. Drop shadows, gradients, and rounded corners are three good examples. We see them everywhere. When used appropriately, and in harmony with a siteâ€™s overall theme and purpose, these enhancements can make a design flourish. Perhaps youâ€™re thinking: weâ€™ve been creating these design elements using CSS for years now. But have we? In the past, in order to create gradients, shadows, and rounded corners, web designers have had to resort to a number of tricky techniques. Sometimes extra HTML elements were required. In cases where the HTML is kept fairly clean, scripting hacks were required. In the case of gradients, the use of extra images was inevitable. We put up with these workarounds, because there was no other way of accomplishing those designs. CSS3 allows you to include these and other design elements in a forward-thinking manner that leads to so many benefits: cleaner markup, maintainable code, fewer extraneous images, and faster-loading pages. This would seem counterproductive to what was just mentioned, namely that CSS3 makes the code cleaner and easier to maintain. Fortunately, many prefixes are no longer needed. Additionally, we highly recommend that developers use a tool that will add prefixing automatically to your CSS. One such tool is called Autoprefixer. Autoprefixer can be included as part of your Grunt workflow to post-process your CSS. With this, you need to include only the standard version of any CSS feature, and Autoprefixer will look through the Can I use… database to determine if any vendor prefixes are needed. It will then build your CSS automatically, with all necessary prefixes. You also have the option to manually process your CSS using an online tool such as pleeease. Whatever the case, in many places in this book we will include vendor prefixes, however be sure to use an online resource for up-to-date information on which features still require prefixes. What do we mean by â€œthe Real Worldâ€�? In the real world, we create web applications and we update them, fine-tune them, test them for potential performance problems, and continually tweak their design, layout, and content. In other words, in the real world, we donâ€™t write code that we have no intention of revisiting. We write code using the most reliable, maintainable, and effective methods available, with every intention of returning to work on that code again to make any necessary improvements or alterations. This is evident not only in websites and web apps that we build and maintain as personal projects, but also in those we create and maintain for our clients. We need to continually search out new and better ways to write our code. HTML5 and CSS3 are a big step in that direction.